Edraw supports more than 200 different diagram types, including audit flow diagram, flowcharts, network diagrams, database models and so forth. 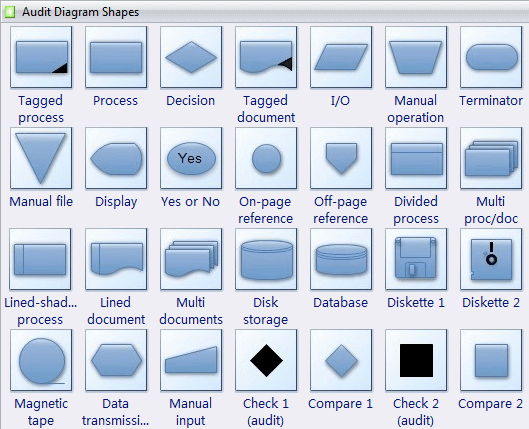 Over 8000 ready-made shapes help to draw professional diagrams, infographics or presentation. It can read and write a number of different vector image formats. Click here to download Audit Diagram Software. Then you can use the built-in Audit Diagram templates to create and present your business process in minutes. The Audit Diagram template provides a means to diagram any auditing process including any type of accounting or financial management task. With Audit diagram template, it's easy to create auditing diagrams for accounting, financial management, fiscal information tracking, money management, decision flowcharts, and financial inventories. Many of the shapes are the same as those used for a flowchart. Of course, the meanings are different in this context. Document 6 Sigma and ISO 9000 processes. 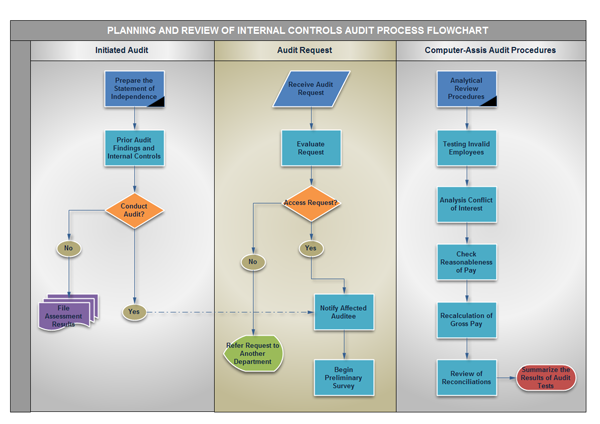 Some professional-looking examples of audit diagram which help you create business diagrams rapidly. On the Library menu, point to Business Process, and then click Audit Diagram. Use the Connector tool to connect the flowchart shapes. Some helpful templates are Arrow Shapes, Backgrounds, Basic Drawing Shapes, Basic Flowchart Shapes, Data Flow Diagram Shapes, IDEF0 Diagram Shapes, SDL Diagram Shapes and Workflow Diagram Shapes.